The countdown for season 2 of 'Knightfall' has begun, as this era of period dramas has made the History Channel one of the best TV networks. With 'Vikings' coming to an end with season 6, 'Knightfall' is expected to be the next flagship for all the right reasons. The gripping story of medieval religious warriors, sworn to protect Christians and the Holy Land while carrying out military operations have initiated a wide fanbase. The show, which first premiered in 2017, begins with the organization of the Knights Templar at the height of its glory, just before its downfall. Season 1 ended with King Philip IV of France (Ed Stoppard), murdering his wife, Queen Joan (Olivia Ross), as she pleaded for her lover, the Knights Templar leader, Landry (Tom Cullen) to be saved. Her unborn child was saved by the Holy Grail, but Landry broke the holy relic in rage. In it was found a vial with a list of names, featuring even Landry's. In the upcoming season, the quest for the Holy Grail will still be on, as well as Landry's conflict with King Philip. While there is much to look forward to, the question is, how accurate is the show with the true story of the Knights Templar? Unlike in the show, the Holy Grail was likely never searched for, forget finding it. Chronicling the rise and ultimate fall of the Knights Templar, the show's action mainly takes place around Landry and its creators have used the creative license to fictionalize the drama aspect of historical truth. Set in the 13th century, the characters, the events, and the dates are not historically accurate, but the essence of it, is. For example, the protagonist Landry is fictional, but Pope Boniface VIII (Jim Carter), Princess Isabella (Sabrina Bartlett), King Philip IV of France (Ed Stoppard) and Queen Joan of France and Navarre (Oliva Ross) are all real historical figures. "We take the key events and characters and weave our story into them," Dominic Minghella, said in an interview. "Much of our content is true to the historical record, and while we take some liberties for the purposes of drama and intrigue, history gives us at least the framework. And — since the Templar story is so rich — often much more!" Of course, the Knights Templar was one of the most powerful entities at the time and were not only extremely wealthy but also heavily influential on people's opinions. 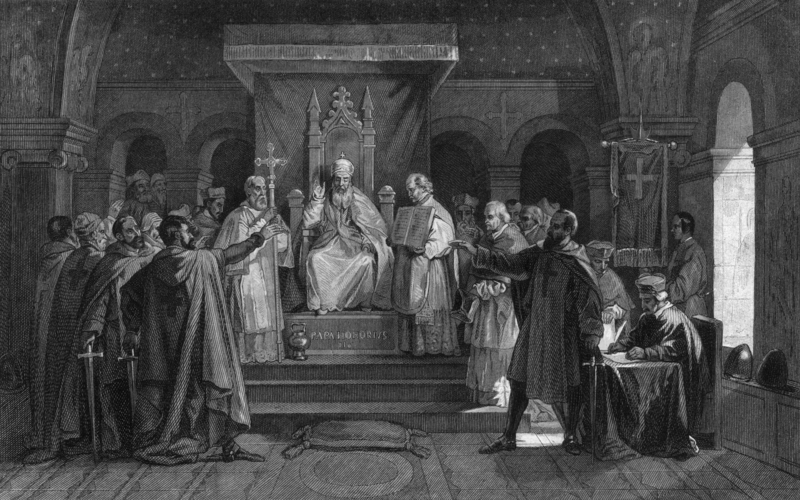 At the height of the Crusades, which refers to a number of religious wars during the medieval period, sanctioned by the Latin Church, the first known Crusade is said to be that of Pope Urban II at the Council of Clermont in 1095. Over the next two centuries, the Crusades were massive, especially the one that took place in the Eastern Mediterranean in order to recover the Holy Land from Muslim rule between 1095 and 1291. However, in the 13th century, the Crusades began to dwindle and the Knights Templar began its downfall. The significant rise and fall of power are fantastically shown in the series and how the fall of Acre, Israel, in 1291 marked the destruction of the last remaining Crusader refuge in the Holy Land. Going by history, what eventually happens is that the Knights Templar is dissolved by King Philip IV of France and scores of Templars arrested and burned alive. It this harmonious blend of truth and fiction, which comes across as fantastical and not always predictable, that makes 'Knightfall' an epic watch. Season 2 premieres on the History Channel March 25 at 10 p.m. ET.